Only a few months ago, he was a successful executive. Now he’s a desperate man. But a divine adventure is about to unfold. Join David Ponder on an incredible journey that will help you discover the Seven Decisions for Success. 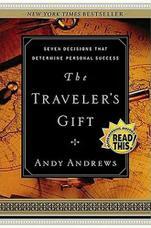 In the tradition of best-selling books by Og Mandino, The Traveler’s Gift is destined to become a classic.